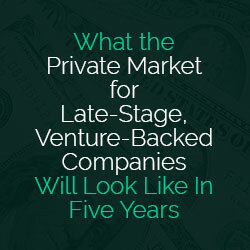 The private market for late-stage, venture-backed firms has grown rapidly over the last three years. Starting in 2012 with just a handful of unicorns, the private market closed 2013 with 36 of them. Then there were 75 in 2014, and 128 by the end of 2015. Today, there are 146 unicorns, with an aggregate market cap of more than $550 billion. With regulatory and market conditions only continuing to support the growth of the private market, people are starting to wonder what this tectonic shift in the capital markets means for the long-term. What will the private market look like in five years? What we see coming is a private market that is far bigger, stronger, faster and better than it is today. That’s good news for the entrepreneurs and growth companies that have chosen to live in the private market. And given the enormous contribution by those same companies to the overall economy, that’s good news for all of us. After years of robust angel and VC investment in start-ups and early stage companies, the pipeline of growth companies flowing into the private market is strong. Each quarter, angels and VCs invest in start-ups, and some number of start-ups grow into revenue producing, mid-stage companies. Others advance from mid-stage to being late-stage, pre-IPO companies. According to CB Insights, venture investors deployed more than $25 billion just last year to fuel the advancement of these companies along this life cycle. Though many innovative companies are still being founded and growing within the private market, very few are choosing to exit it. There have been essentially no tech IPOs since December of 2015. Only during the 2008 financial crisis has there been a longer IPO dry spell. The rapid growth of the private market has been driven by (1) the steady pipeline of private companies growing into $1 billion valuations, (2) the continued growth of the companies already considered late stage – e.g., unicorns becoming deca-unicorns and (3) the very low number of companies selling or going public. Looking forward, even if we assume the unicorn growth rate slows to 20% per year over the next five years, there will be more than 350 of them, with an aggregate market cap of over $1 trillion dollars. The capital base supporting private companies will also be stronger and deeper than it is today. Like water seeking its own level, capital seeks growth. Historically, IPOs presented such opportunities, but that has become less and less the case over recent years. As a result, growth investors have been migrating into the private market in large numbers. Now many of the large mutual fund complexes and other traditional IPO buyers are investing in private companies regularly. New mutual funds are being raised expressly dedicated to the late-stage venture asset class. Family offices, and the wealth advisors and private banks that cater to them, are aggressively seeking private market deal flow. These are long-term investors; many will be supporting the private market companies they now back for years to come. Over the next five years, the private market will become more efficient and liquid. There will be more secondary transactions, and they will happen faster and more reliably. We’re already seeing that at SharesPost. In 2015, we closed transactions for roughly 500 clients in more than 50 venture-backed, private companies. Because company issuers have become more accustomed to secondary transactions, they are approving the sales faster and more often. At SharesPost, the average time to close a transaction has been declining because issuers are more frequently waiving their right of first refusal and expediting the process. Because we have become more effective at matching sellers with the kinds of investors desired by companies, the transactions we submit to companies now close more than 95% of the time. Because unicorns are raising large amounts of capital, they are being required to disclose more financial information to a broader audience than the historical norm. As public market investors migrate into the private market, they will call for even more disclosure. With more transactions happening, investors will see greater amounts of market data to inform their investment decisions. We also expect to see more research analysts covering private market companies in the near future. With more robust disclosure, data and analysis, the private market will become increasingly transparent and efficient in its pricing. We are encouraged by what we see ahead for the private market. We believe that innovation is best supported by the intelligent application of large amounts of patient capital. The direction of the private market with regard to each of these attributes is positive and accelerating. 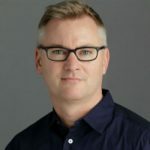 Greg Brogger is the CEO, Founder and Chairman of the Board of SharesPost, Inc. Greg founded SharesPost in early 2009 to bring transparency, efficiency and scale to private securities transactions. Prior to SharesPost, Greg was a co-founder of TrueCar (Nasdaq: TRUE) where he was responsible for the company’s early strategic partnerships. Greg was a member of the founding team at CarsDirect.com (now called Internet Brands - Nasdaq: INET) and was Idealab’s VP of Business Development. Greg is also an angel investor through his incubator and fund, BrightHouse. Earlier in his career, he advised technology companies as a securities lawyer at Wilson Sonsini Goodrich & Rosati. Greg received his BA from UC Berkeley, his JD from the University of Pennsylvania and his MBA from The Wharton School.